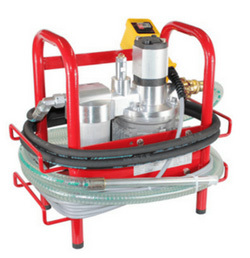 The filtration unit OFX serves as a portable service unit for filling and draining hydraulic systems. Due to the maximum permitted operating pressure of 4 bar, also supply circuits of hydrostatic transmission drives and work hydraulics in a closed circuit can be filled and vented. The handy design and light weight make it ideal for service calls on mobile machines (e.g. construction, agricultural and forestry machinery, municipal vehicles). Existing contamination and air pockets, for example after repairs, can be specifically removed before commissioning in a very short time. *** Product number not available at the moment.